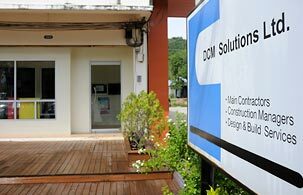 you are here : home > home & decor > DCM Solutions Ltd.
overview of DCM Solutions Ltd.
DCM Solutions Ltd was established by industry professionals originating from reputable international construction contractors operating in Thailand. These include Christiani & Nielsen, Bouygues, Nishimatsu, Mivan, Gammon and Bovis Lend Lease. DCM Solutions Ltd is a main contractor that undertakes all scopes of work required by the client and coordination of any elements the client may wish to undertake directly. DCM has successfully completed many major construction contracts in Thailand and continues to exceed expectations throughout the country. The company has been successful due to the experience, managerial skills and the technical knowledge of its staff that, when pooled together, have proven to deliver results. We continue to build our company focusing on the quality and career development of our people in order to produce better results for ourselves and our clients. DCM has achieved ISO 9001:2008 as well as ISO 14001:2004 certifications for its quality management and environmental management systems, respectively. DCM also offers construction management and design & build services. Please visit our website for more information and pictures of past projects. photo gallery of DCM Solutions Ltd.
map & location of DCM Solutions Ltd.